Father Jerome as he is more commonly known in the city of Brighton & Hove, UK, is the Provost and Administrator of the Brighton Oratory. November 2018 he was elected a Vice-chair of the Board of Trustees of Brighton & Hove Faith in Action a charity representing and promoting cooperation between faith communities in the city and in March 2019 became Acting Chair. He is also Chair of the Combatting Faith Hate Partnership. In 2009 he co-founded The Hub homeless drop-in partnering with the Salvation Army. He is a former Chair (2010-2011) of Churches Together in Central Brighton and has been its Secretary since 2014. He is also founder and Director of Cherubs Kitchen, an apostolate providing NVQ catering apprenticeships and work placements. Father Jerome also has a developing Music Therapy ministry and chhaplaincy to nursing and retirement homes in the city and surrounding areas and he was a founding member of “Peace of Mind – Churches Working Together in Brighton & Hove” an ecumenical project focused on congregational awareness of Mental Health. In 2008 he began broadcasting the daily Mass on the internet for the housebound and dispersed faithful, attracting approx 150 viewers a day through Facebook. Throughout schooling and higher education Metropolitan Jerome studied music and voice and is a classically trained and experienced musician (piano/pipe organ) and vocalist (baritone). He studied with Anne Marsden-Thomas (of the International Organ School) and Dr Martin Neary (of the Royal College of Organists) continuing his vocal studies too through the Royal School of Church Music and the Associated Board of the Royal Schools of Music. After Sixth Form he won a scholarship to study voice and keyboard at the Conservatorio L. Cherubini in Florence and as a dramatic performer when he took the name “Jerome Lloyd” (née Cave) professionally (Equity registered). His Grace has consulted on music for choirs and music groups of various traditions/churches and theatrical productions. Metropolitan Jerome read Divinity at y Coleg Diwinyddol Unedig (the United Theological College, Aberystwyth of the Aberystwyth & Lampeter Schools of Theology) where he was acting Director of Music for the College and organist at Llanbadarn Fawr and Holy Trinity churches (the then Vicar, Andrew John is now the Anglican Bishop of Bangor, Wales). He then received a Traditional Catholic pre-Conciliar seminary formation on the continent in Switzerland and Italy for a further four years studying theology at Fribourg, Turin and Rome. He has a comprehensive knowledge of Latin and his main academic interests are in Ecclesiology, Liturgy and Canon Law. Metropolitan Jerome is competent in Welsh and French (paternal family ancestry), Cantonese/Mandarin (maternal Chinese/Singaporean ancestry), German, Italian, Spanish (through academia) and English. 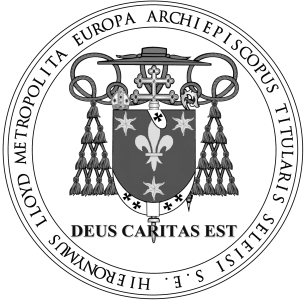 Upon his episcopal consecration in 2012 he was awarded the substantive degree Doctor of Divinity jure dignitatis by St Jude’s Seminary (Toronto) and in 2018 he was additionally awarded the degree Doctor of Divinity honoris causa by St Francis of Assisi Seminary (Chicago). Supporting himself through secondary and higher education, Metropolitan Jerome sustained himself employing his love of food, gaining experience and training in the hospitality and leisure industries through part-time and occasional full time work and certificated courses. Beginning with a “Saturday job” as a kitchen-porter aged fourteen, his propensity for culinary skills soon became apparent and he began to be apprenticed, taught and mentored to become a qualified chef. Evening classes at tertiary college after Sixth Form studies honed his skills and he gained City & Guild professional qualifications. Thus he was able to support himself through higher education both at home and abroad, and gain a variety of skills and experience cheffing that he would later employ to further and support his ministry. A founding member of the Society of St John Vianney in 2005 and later the Oratory of St John Vianney in 2007, Metropolitan Jerome is dedicated to applying the spirituality and pastoral zeal of the saintly Curé d’Ars to his ministry as a pastoral priest. The Oratory is a Congregation of secular Clergy of regular observance, dedicated to emulating the spirituality and vocation of St John Vianney, the Patron Saint of Parish Priests. In 2005 Metropolitan Jerome was appointed Rector of Formation and in 2006 Vicar General of the Province of Europe and an assistant chaplain at the Community of the King of Love retreat centre in the High Peak district of Derbyshire. In 2007 His Grace became resident Provost at the Mother House of the Oratory of St John Vianney at Cosgrove in Northamptonshire and in 2008 returned to Brighton to plant the foundations for the Brighton Oratory. On January 1st 2012 Archbishop Boniface Grosvold (memory eternal) of the Old Roman Catholic Church announced the election by the holy Synod of Metropolitan Jerome as Apostolic Vicar for Europe and Metropolitan Bishop-Elect of the Province of Europe. Receiving the electoral approbation of the Province’s clergy, and the support of ecumenical referees, Monsignor Lloyd was consecrated Titular Archbishop of Selsey, Metropolitan Archbishop of Europe and Diocesan Ordinary of Great Britain on Saturday, May 5th 2012, the feast of St Pius V by Archbishop Grosvold and Archbishop Jean-Marie Denis Ngodobo of Cameroon. By kind permission of the then Anglican Bishop of Huron represented as witness to the Consecration by the diocesan Precentor, Canon William Cliff (now the Anglican Bishop of Brandon, Canada), the Consecration took place in the Collegiate Chapel of St John the Evangelist, Huron University College, London, Ontario, Canada as recorded in the Register of Services held there. On Saturday 26th May 2012, Metropolitan Jerome was formally installed as Metropolitan Archbishop of Europe during a service of Inauguration which took place before ecumenical witnesses and a large congregation in the Brighton Congress Hall. Due to the public character of episcopacy and his episcopal consecration being a matter of public record, after a thorough unsolicited investigation and at the insistence of Her Majesty’s Passport Office after consultation with Buckingham Palace and the Home Office (passports are the property of the Crown, bear the royal coat of arms and are issued under the royal prerogative); the title “Titular Archbishop of Selsey” replaced His Grace’s family title and surname on the Information[/photo] Page of his passport and his full name and ecclesiastical title are given additionally on the Observation’s page. Thus His Grace may be identified legally by his title. His Grace is thus effectively the first bishop recognised by the Crown to hold the titular title of the See of Selsey, founded by St Wilfrid of York in 680 AD, since that See was dissolved under it’s last bishop, Stigand and the cathedra transferred to the new See at Chichester in 1075. His Grace is also the Servant Superior of the Congregation of the Divine Charity, the umbrella congregation for religious and apostolic life in the Orthodox Old Roman Catholic Communion. His responsibilities include the governance and oversight of religious and consecrated persons within the communion and the promotion of the religious life. In November 2017 during the holy Synod of the Orthodox Old Roman Catholic Communion held in Chicago, IL, His Grace was elected “Primus” (inter pares) the “first among equals” of and by his brother bishops and clergy. It is the privilege of the Primus to chair the Episcopal College, the holy Synod and the Primatial Council; the Primus enjoys no other privilege than being accorded first in honour among his colleagues. Metropolitan Jerome has a keen interest in the plight of persecuted Christians and has been eager to express solidarity with those suffering in the Middle East for some years. Appreciating the history of our church with the Patriarchate of Antioch & All the East, Metropolitan Jerome has continually tried to highlight the plight of Syrian Christians (where the Antiochian Patriarchate has its headquarters in Damascus) to churches in the West. In 2009, before the crisis in Syria escalated, Met. Jerome brought a Syrian refugee working as a Brighton taxi driver to a Churches Together in Central Brighton meeting to relay first-hand testimony about the plight of Christians in Syria from the rebel forces. In 2015 he was invited by Lord Laird of Artigarvan to be a keynote speaker in the House of Lords at a debate about the Syrian Refugee crisis and in recent years has been networking to provide Syrian Refugees in Brighton (declared a “City of Sanctuary”) a welcome, offering support and assistance in our city from various projects including “The Hub” and “Cherubs Kitchen” apostolates. In 2016 Metropolitan Jerome was nominated a Fellow of the Royal Society of Arts in recognition of his charitable work. For many years His Grace has combined vacations and pilgrimages to visit the Middle East to appreciate the cultural tensions and encourage Christians living there. In March 2017 he visited Turkey where religious tensions are rising due to the crisis in Syria and Christians are emigrating, and he addressed local Christians and pilgrims in the House of Mary at Ephesus. On Good Friday 2017 he hosted Canon Andrew White for Churches Together in Central Brighton and interviewed him about the situation in the Middle East (video above). Having been a “worker priest” for much of his ministry, Metropolitan Jerome also has a background in leisure and hospitality gained as a restaurateur and licensee. As a former small business owner and member of the Federation of Small Businesses, his knowledge also extends to Human Resource management, Health & Safety, retail and marketing as well as Food Hygiene. Metropolitan Jerome’s experience also includes being a former Trade Union Representative (Public & Commercial Services Union) and a Staff Sports & Leisure Association Rep’ (HASSRA) in the Civil Service (Department for Work & Pensions); where he worked originally as an Employment Advisor, then in Marketing and Business liaison (Sussex & Surrey) and finally as a consultant in IT Project Management and support (London & South East England). All of this experience has perfectly placed him to act as an industrial chaplain to a number of small and large businesses in the city. Founding his own performance agency and production company, LRAPA Productions in 2002 whilst on sabbatical, he later produced various productions of both music and fringe theatre in the Brighton Festivals 2003/04/05. The then Father Jerome performed at the Brighton Royal Pavilion, the Brighton Dome and Theatre Royal both as a musician and as a singer/actor in cabaret and consulted as a musical director on a variety of performances both amateur and professional. As the first Chair of The Friends of St Andrews he also helped to establish the then redundant St Andrew’s Church Waterloo Street as a community centre and performance venue with monthly “Friday night is music night” concerts showcasing local performance artists. The Archbishop is well known in Brighton & Hove for his commitment to fundraising for local charities utilising his many talents, perhaps most famously walking a tightrope in 2009 for the Sussex Beacon HIV/AIDS Hospice (video below). Earning the trust and affection of the circus artistes following his tightrope walk and after the death of the Revd Roly Baines, Metropolitan Jerome became Chaplain to Zippos Circus. He has regularly performed for the Mayor of Brighton & Hove’s annual Charity Gala and with celebrities Dame Vera Lynn (St Dunstan’s home for blind war veterans) and Dame Felicity Lott (for Radios in Hospitals) appearing himself as “a Dame”! In the spirit of ecumenism, he formerly directed the Choir of Dorset Gardens Methodist Church for five years and restarted the annual citywide and ecumenical “Messiah from scratch” and Stainer’s “The Crucifixion” performances, as he had done in Aberystwyth as a student. He has been Musical Director of the annual Rottingdean Drama Society pantomime since 2010 and of the Brighton Revue Company since 2013 (following the late John Gould). In 2013, Metropolitan Jerome found a way to utilise his experience in the hospitality industry and founded the “Cherubs Kitchen“ apostolate inspired by the homeless drop-in he partnered with Majors Mark & Tracy Bearcroft at Brighton Congress Hall in 2009. Noticing that some of the guests had experience in catering he determined to find a way for such to be enabled to return to work. “Cherubs Kitchen” now operates commercial franchise operations across the city providing work experience and work rehabilitation opportunities and NVQ apprenticeships in professional catering. The profits from the franchises go to support various homeless support projects across the city. Metropolitan Jerome’s personal interests include languages, traveling, reading (favourite author Ellis Peters) classical music, theatre and performance, art and culture, anthropology, history and writing. The Archbishop willingly admits to liking Sci-fi though he is not a “Trekky”! His Grace is also appreciated by his ministerial colleagues, friends and family alike as a keen chef whose famous “Spaghetti Carbonara” is a signature dish learnt from a formation sponsor family in Rome, the recipe of which is a highly guarded secret!